When Nikos Kazandzakis wrote the Greek Zorba did not suppose that the final scene in which the two main characters of this novel danced Sirtáki, will be moved to the silver screen after 18 years. Directed by Michael Cacoyannis with Anthony Quinn, the film is today one of the classics of cinema, and most of us have at least seen this key scene with a steep mountain in Stavros. Although it has been 50 years since this film was made, the older residents of Stavros remember and remember the film crew to this day. In the Mama's place's tavern, where Anthony Quinn ate Cretan cuisine and learned to dance sirtaki, you will find today photos of those events. One of them is on every table, because it is a menu cover. Stavros used to be a small fishing village. Today, it is above all an increasingly popular tourist destination. About 14 km from Chania and located on a picturesque bay on the northern coast of the Akrotiri peninsula, it is known for its beautiful sandy beach and clear blue sea. There are more and more tourists taking their vacation in this town every year. Stavros itself has the space of the last few years has changed quite significantly. The coastal taverns have grown, there are sun loungers and there is more beach infrastructure. Above all, "Zwiaba watches" on the big poster next to the beach. Despite the growing popularity Stavros is still a quiet corner, which many years ago fell into our hearts and to which we gladly return if there is an opportunity. If you are looking for a place with a nice beach and a shallow, clean and calm sea, this place will be the perfect choice. Sandy, gentle bottom is its additional asset. There are a lot of little hotels and apartments here, but there are not many stores. 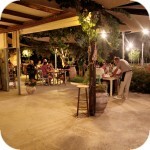 In the taverns located near the beach you can enjoy Cretan cuisine prepared with fresh ingredients. Stavros is most conveniently accessible by car or scooter, but if you do not have the same means of transport, you can also get here by KTEL. Several times a day a bus from Chania arrives here. However, it is worth to plan such a trip, because there are 2-3 hours break between consecutive courses. Departure times of this bus are best checked on a regular basis at the KTEL station in Chania . In the town itself there are basically two large beaches. It is separated by a peninsula where you can see the remains of a quarry from which limestone was extracted to build the walls of Chania in the Venetian era from the 13th to the 17th century. The main beach is located east of the village and is located by the bay at the foot of the mountain where Zorba built the famous ski lift. The gentle round bay provides excellent protection against the winds, so there is also a place for a small fishing port. Calm water, shallow, gentle and sandy bottom is a perfect place for people who prefer relaxing swimming, and do not necessarily want to deal with the sea waves. This place will also be liked by families with children who will not want to leave the water. Stavros is appreciated by local Greeks who come here a lot during the weekends. This beach has a very extensive tourist infrastructure. There is a car park, toilets and taverns mentioned above. Beach chairs can be rented at an affordable price. The second beach, which is not guarded, is located 200 m north-west of the main one. However, it is more wild and the entrance to the sea is more rocky. There is no bay protecting against the wind, so the sea is not so calm. Akrotiri peninsula, on which Starvos is located, is located in the close vicinity of Chania . Driving along the Nowa Droga Narodowej you have to get to the area of ​​this city and then using the exit leading to the port of Souda, enter the Akrotiri peninsula. Continue on your way following the signs. After less than 15 km, you will reach Stavros.